I have alluded to this exceptional book in a previous post, and have been wanting to publish this review for many weeks now. Once in a rare while, we come across a book that has rich topical value, but which can also be read simply for the elegance of its language. Of Birds and Birdsong is one such book (M.R. James’ Ghost Stories is another that readily comes to mind). If you possess a love for the English language, you’ll enjoy this book immensely even if the immediate topic – birds – is not of any great interest. Madhavaiah Krishnan (1912-1996) was not just an ornithologist. He was a naturalist and photographer par excellence. For a man with so brilliant a mind he was a failure academically, and tried his hand at an astonishing variety of vocations (including implausibly, goat grazing). But he was a prolific writer and wrote a column for The Statesman which ran for an astounding forty six years, the last piece being published on the day of his death. He was also an artful photographer, producing masterful black and white images from the natural world using equipment he had rigged together himself and dubbed the Super Ponderosa. Krishnan served on the advisory committee of the BNHS, on the steering committee for Project Tiger, and on the Indian Board of Wildlife. He was awarded the Padma Shri in 1970. 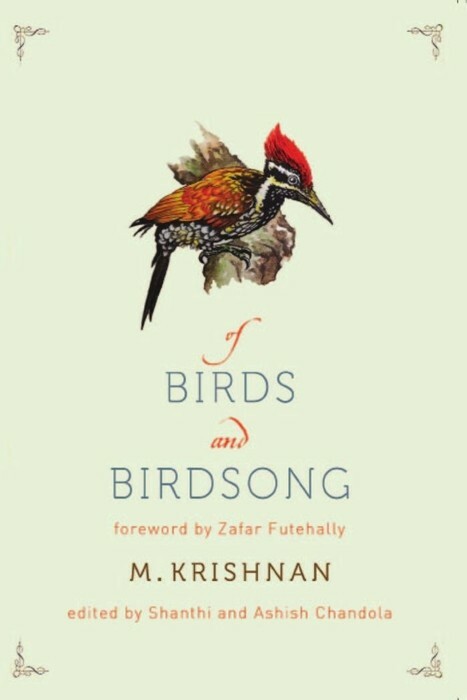 This book brings together various pieces Krishnan wrote about birds, over the years. Some of the pieces are quaint given their vintage, like the ones on partridge and gamecock rearing, and pigeon post. Many others are short, straightforward profiles of certain species – the ones on the sarus crane, painted stork, grey junglefowl and changeable hawk eagle for instance. The more delightful ones are infused with personalized observations and anecdotes. There is an essay on the dangers of putting up nest-side hides, and on the precautions to be taken to prevent nest abandonment. There is another very short piece on the significance of the siesta in the animal and bird world. There are two entire sections devoted to pieces that deal with bird calls, and bird flight respectively. As I have mentioned before, one cannot but help feel that Krishnan’s keen sense of observation was in a word, staggering. Wondering about the allusion to the sweet voice of the parakeet in Indian poetry while the call itself is a harsh screech in reality, Krishnan observed that the rose ringed parakeet has a “low, long, tremulous, ineffably sweet call” when summoning its young to the mouth of the nest-hole. Elsewhere, he painstakingly counted the number of times a hoopoe folded and unfolded its crest in the duration of a minute, and observed how the flicking of the crest expressed “the entire emotional range of the bird”. On yet another occasion he writes about trying to time the rapping beat of a woodpecker with a stopwatch. Once every few pages, you are guaranteed to come across a word you’ve never heard of. Krishnan’s vocabulary was immense, and his love for finding the right word was deep. Whoever thought the grey wagtail’s belly was gamboge in colour? I was piqued by use of the word volplaning on multiple occasions and looked it up. Perhaps I’ve seen it used before, but I cannot recollect it. Krishnan was a voracious reader and there are umpteen literary references and allusions scattered all through the book – Lockwood Kipling, William Blake, Richard Lovelace, et al. Moreover there are plenty of references from nature writers of his and earlier generations – men like Konrad Lorenz, Douglas Dewar, ‘Eha’, G.M. Henry, G.P. Sanderson and David Cunningham. Literary aesthete aside, the book has a wealth of information on over a hundred species of birds from the subcontinent. Much of this is derived from painstaking personal observation over the years. And the anecdotal narrative makes it good fun to read, for most part. In summation, I found this book breathtaking. If you are reading this blog, you probably have some sort of interest in the natural world and if you do, this book definitely belongs on your bookshelf. There is a useful ‘notes’ section at the back of the book which among other things, gives the current names of many of the birds. I however felt that these alone could have been footnoted along with the text, for more convenient referencing rather than being placed separately and at the end. But this is admittedly a minor inconvenience. I had spotted this little book in the library of the JLR K. Gudi camp a few months back, and dipped into it for a bit over the next couple of days. I liked it well enough to order my copy as soon as I got back. The book took me longer than expected to get through. At a little over three hundred pages, I would have expected to speed-read my way through it in less than a week’s time. It has taken me more like three. And that is not because the book is not readable. On the contrary, it is superbly readable. It is just that it is too rich in terms of the information it is loaded with and that makes it hard to binge-read. Smaller doses are the order of the day. A.J.T. Johnsingh needs no introduction, but a book review of this sort probably deserves a brief profile of the author. So here goes. A chance discovery of a Tamil translation of Corbett in his boyhood days set Dr. Johnsingh on a path that eventually made him one of India’s best known field biologists. Inspired further by a chance meeting with JC Daniel of the BNHS, Johnsingh undertook a study of dholes in Bandipur in 1976-78. This was the first study ever by an Indian scientist of a free-ranging large mammal in the wild. It also earned Dr. Johnsingh his Ph.D. This was followed by a post-doctoral research stint in the United States. Johnsingh then joined the Wildlife Institute of India (WII), Dehradun in 1985 and rose to retire as the dean of the faculty of wildlife sciences in 2005. He is now a member of the National Tiger Conservation Authority and continues to be actively involved with various initiatives. The book is a collection of pieces published by Dr. Johnsingh for lay audiences in various publications over three decades, between 1972 and 2005. Almost half of these were published in the WII Newsletter over the years. The book is organized by region, into five sections. These deal with the south, central/west, north and the north-east of India, with an additional section covering countries further east. While well known PAs like Kanha, Kaziranga and Bandipur are profiled, a host of lesser-known places are also dealt with masterfully – PAs like the Pakhui WS (Arunachal Pradesh), Dampa Tiger Reserve (Mizoram), Bhagmara Pitcher Plant Sanctuary (Meghalaya), Srivilliputhur Grizzled Giant Squirrel Sanctuary (TN) and Point Calimere Wildlife Sanctuary (TN). In all, over thirty PAs are covered. The narration is a delightful mix of personal experiences, detailed floral and faunal descriptions and prescriptive observations. For many of the pieces which were written decades back, there are thoughtful post-scripts provided which outline the current situation. Dr. Johnsingh’s extraordinary knowledge of his stuff is obvious, the book is fairly well-written and the anecdotes it is peppered with are fascinating. Plenty of chilling encounters are recalled – crouching in lantana to hide from an enraged cow elephant in Bandipur, running into a pair of gamboling leopards in KMTR, his first and terrifying sighting of a tiger in the wild – he was blowing into a medium-bore rifle cartridge to mimic the whistling call of a dhole, and instead brought an indignant tiger charging out of the undergrowth. There are plenty more like these. You’ll enjoy them. A quick mention of the pieces I especially liked. The narrations of walking through the Periyar TR and Neyyar WS make for fine reading. 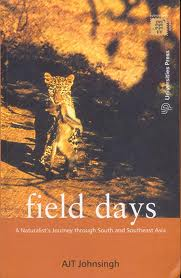 Two chapters deal in some detail with the years Dr. Johnsingh spent in Bandipur and are engrossing. When I reached this topic, I was especially interested in reading Dr. Johnsingh’s version of a gruesome incident I had read about in another book (Wildlife Memoirs by R.C. Sharma). 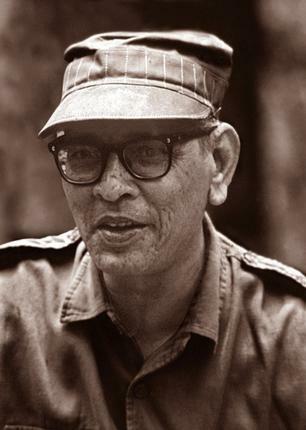 In ’77 Johnsingh had accompanied Rajasekaran Nair, who was guiding a bunch of trainees from an institution which was the precursor to the WII, into the forest on foot. Dr. Johnsingh’s mortal fear of elephants has been mentioned in more than once place, including by him. As luck would have it, a tusker they ran into charged and killed Nair, leaving Johnsingh unscathed but traumatized. This tragic incident was recounted in Sharma’s book as he was one of Nair’s trainees on that trip. And now I read Johnsingh’s own version of what transpired. The chapter on Gir is fascinating, as is the fairly detailed piece that talks about how Kuno-Palpur was identified as a viable alternative habitat for the Asiatic lion. Corbett aficionados will like the narrative on trekking through the Ladhya and Sharda valleys. 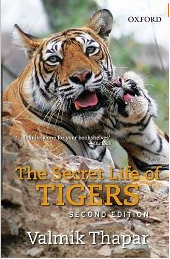 The chapters on Rajaji NP, Pin Valley NP and one on trekking in the Lushai and Garo hills are spectacular as well. Dr. Johnsingh is quite evidently besotted with angling, and an entire chapter is devoted to the fate of the blue-finned mahseer in Parambikulam. Johnsingh also speaks wistfully of fishing for carnatic carp with spoons in the Tambiraparani (in KMTR), and of landing a 5-6 kg mahseer on his first cast in Parambikulam – an incident that he says, made him an admirer of the species forever. In conclusion, if you have an interest in wildlife or conservation, this is a book to possess. Apart from the pleasure of reading it cover to cover like I did, the book is probably invaluable to check through specific chapters when you plan to travel to any of these PAs. There are personal insights and a level of detail that is hard to match elsewhere.